Are you wondering why you should choose Rentfaster.ca over a free listing site? We would like to break it down for you. The difference between Rentfaster.ca and free listing sites is functionality and ease; simple as that. They differ within security, account creation, ease of use, and additional features. It may seem like a good idea to post your rental for free but what are you really getting for that $0 price tag? Is it commitment you are scared of? Rentfaster.ca allows everyone to make an account free of charge! Once you’ve seen just how useful the landlord login actually is, posting a rental is only $30 (plus applicable taxes). Although free listing sites may be free at the beginning, these sites are rarely actually free Free listing sites will let you post for free, but ask for payment to keep your listing relevant and reposted daily, versus falling to the bottom of the list. Rentfaster.ca doesn’t require additional payments and doesn’t let your listing fall to the bottom. Instead, your listing will appear based on search results! Rentfaster.ca has high functionality making your rental sale easy to track and manage. And like other sites, it is always free for renters to find you – so there are no limitations there. 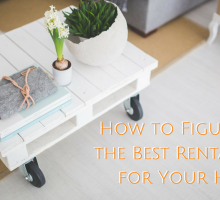 In fact, many renters already know that Rentfaster.ca is the place to go to find quality rentals with trustworthy landlords because it is not free to post. The site also provides a heightened security and great features that make it optimal to use. 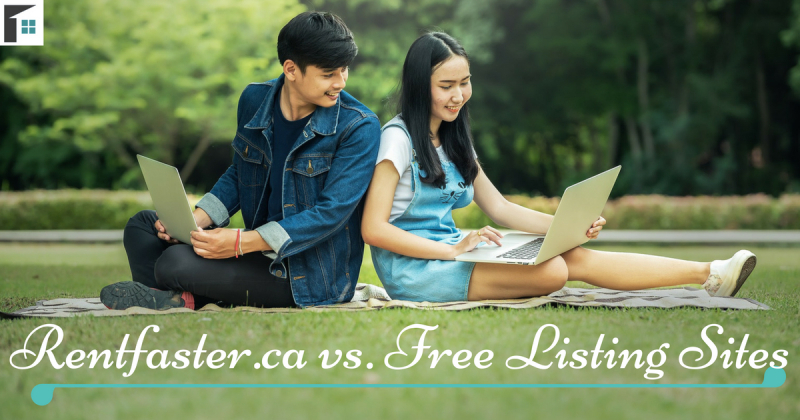 Here we analyze the differences between creating an account with Rentfaster.ca vs. using free listing sites. 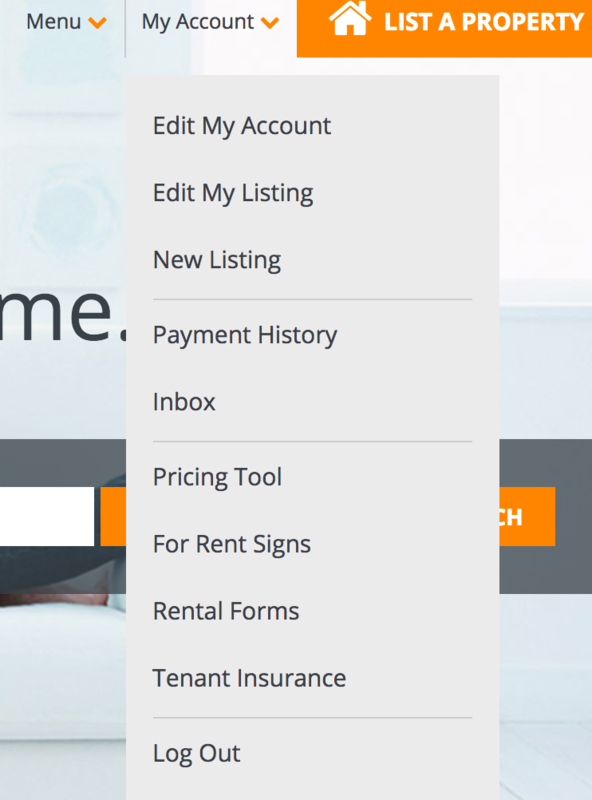 Free listing sites will often have a small account feature that allows you to manage and edit your rental listing. Most times, however, that is all these sites will offer. 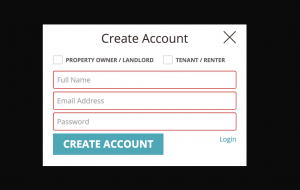 Rentfaster.ca has free accounts with a number of functions. An account with Rentfaster.ca will let you manage your listings, view statistics, and sign up for notifications. While the listing itself may not be free, you can rest easy knowing that your listing is easily found within our search engine as well as sent out when people subscribe for similar listing criteria. Additionally, you have the benefit of changing rental listing information at any time without removing the ad. With many free listing sites, any changes will require you re-post the listing, often removing it in the process. The great thing about Rentfaster.ca is that your information will never be lost. Free listing sites will often remove the listing and all of information and images with it. With Rentfaster.ca, even once you have rented your space the information remains accessible if you want to rent it again in the future. In addition, you get a deal! When you reactivate a listing the fee is only $25+applicable taxes (For Single Unit Listings) versus paying the whole amount again. With your Rentfaster.ca account, you will have access to market information regarding your listing. You can see how many people have viewed your ad and can receive daily, weekly, or monthly reports regarding your listing’s activity! As a landlord, Rentfaster.ca makes it easy for you to compare your property to the competition. With your account, you can see how your property compares and quickly view other properties to see where you stand. In addition, Rentfaster.ca will provide you with trend data to help you understand the market and make better pricing decisions to better sell your rental! When you have rented your listing, updating the price negotiated helps the page’s statistics, helping you and those with similar listings stay competitive. Whenever you list a rental, you can view the statistics of similar rentals to figure out the best price. Creating and managing a listing has never been simpler! 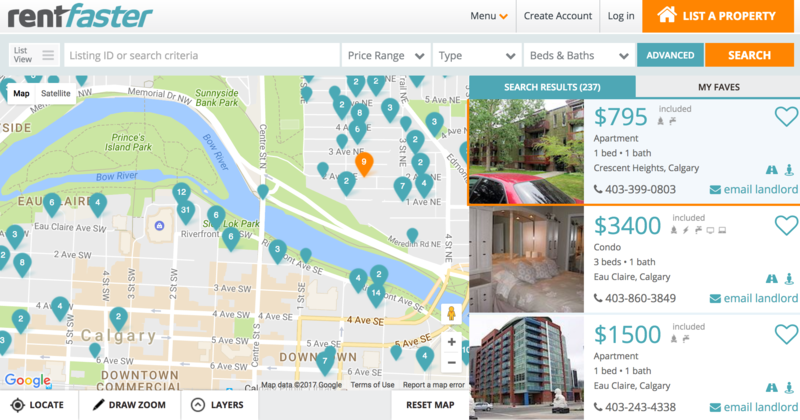 Recently, Rentfaster.ca has enabled “Map View” and “My Favorite Listings” tabs within the search engine. No longer are you stuck keeping hundreds of browser tabs open. Instead, access all the listings on one page. Since location is everything, Map View search allows you to view a list of the rentals along the sidebar, as well as view the rentals on a map. After narrowing down your criteria, finding out if your ideal rental is in an ideal location is as simple as hovering over the side listing, highlighting it on the map. Most free listing sites do not have a visible map to view listings. In place of this feature, they have a link that takes you to a Google Maps site – forcing you to leave the current site and track many tabs. Other times you will need to actually copy and paste the address into another browser tab yourself. With Rentfaster.ca, when you find a listing of interest, clicking it will open an inner window instead of being sent to another page (and having to click back). Closing this window will not lose your place in the search. When you find the listing you love, click the heart located on the listing. This will add the listing to the “My Favorites” tab at the top. To review your favorites, click the tab and all your top picks will be listed for you to compare and review, no URL saving necessary. At Rentfaster.ca, security is important. When you post a listing, you can now worry less about who is responding to your ad. Rentfaster.ca takes action to prescreen tenants and renters to ensure that you engage with the most reliable people. As well, the staff at Rentfaster.ca consistently look for spam throughout all listings. On free listing sites, you do not have the comfort of knowing that people responding are screened. It is often on free listing sites that horror stories can occur. Rentfaster.ca’s review process includes mapping functionality and allows you to view and access documents and contracts whenever you like. Free listing sites will not have the same high security to screen tenants/renters. This leaves you more vulnerable to possibly untrustworthy individuals. Take away the stress of the unknown and feel confident in your rental interactions with others. 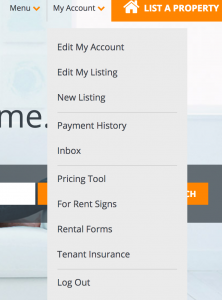 Your listing search is not limited to finding and managing your rentals alone. With the free Rentfaster account, you have access to quality information and documents. View rental statistics (price, time on market, averages, etc.) and compare this information to your own listings. Free listing sites do not have the access and ability to analyze properties, choosing not to share the information with users. When you sign up with Rentfaster you are granted access to all data that our system has gathered to ensure you have everything you need to rent your property competitively. Another feature that is not often seen with free listing sites is rental photography. Getting sellable photos of your rental is important and can improve the effectiveness of your listing. Unlike free listing sites, Rentfaster offers professional photography for listing your home. For a great price, you have access to getting amazing rental photos that will help you rent your space in no time! Finally, free listing sites do not offer the high-level documents required to complete a transaction. Simple and professional rental applications and leases will ensure that all information is gathered to protect the safety and security of all parties involved in a rental. For those who are not professional property managers, these simple documents save a lot of stress and time – and could likely be some of the most valuable tools on the site. The Rentfaster website is stress-free to use, organized, and verified to ensure you can find and list your rentals with ease. Check out our website to get started on finding/renting the perfect listing!